It gets to this time of the year, right before the Parish Walk when I'm scared to do anything in case I get injured. You can pull something moving a piece of furniture, picking up your child, or going up some stairs. Training is the obvious fear, I went out walking yesterday to get a steady 8 miles in and went over on my ankle slightly, it didn't hurt at the tine and I'm hoping that it's nothing, but it was one lapse in concentration and the pavement was uneven. The reason I went out training was to see if the pain I experienced last week whilst walking was still there... I'm happy to say that the morning after I feel ok (touch wood)!! 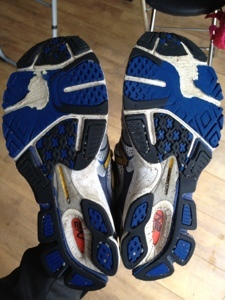 I put my trainers on the radiator to dry after getting in from the rain and noticed that the tread has worn down near the front (see pic below) and am concerned, do my readers have any advice on what I should do? They are my preferred trainers, but I do have pairs of back ups, but psychologically, changing my lot at this stage may knock my confidence and mental positivity? Thanks for reading this paranoid rant... Will be more upbeat next time (promise)! Stick with them but keep in mind that it's best to avoid any iron-work in the road or painted lines as they get really slippery. Actually, it is best to avoid them anyway. Self doubts are perfectly normal at this stage. I find myself constantly checking the long range weather forecast. I know it is pointless. I know it will change daily between now and the start and, in any case, there is nothing I can do about it. But we all have nervous energy to get rid of and we aren't training as much or as hard as normal so we become OCD nightmares for a few days, worrying about every twinge, every ache, do I have enough of X, what if Y happens etc. Those trainers are fine Paul. Mine generally tend to wear down in exactly the same place. If you wanted to try and stop them wearing further you could always treat them with a bit of shoe-goo. It's a liquid rubber compound that sets overnight and is extremely hard wearing. Don't cover any area other than the worn bit as it is quite heavy, and do not change your trainers. They've taken hundreds of miles to get like that, another 85 won't make much difference. Just relax this week, it's natural to be nervous, but as long as you're prepared, you'll be fine! Thanks guys. Your advice really helps a nervous walker who needs to get his confidence level back up! Thanks for your support throughout the blog writing! Great to meet you the other night Ed, did my confidence the world of good knowing you had similar experiences to me during training etc. I agree with the others (and I have a trainer purchase problem which you will have seen if you read my 2011 blog - it is now worse than ever!) I would recommend that you keep with the ones you have, but take at least one spare pair with you and a pair of fresh socks. Although it is sometimes a pain stopping, if you are having problems, fresh shoes and socks can work well for - if getting blisters the fresh shoes and socks tend to ease the pain; I swapped in Ramsey last year and that worked fine - also if raining a dry pair is really useful (I tend to take 2 spares now - just so I know I have them if really wet).